Williams, who hails from the Turks & Caicos Islands, created history in 2013 by becoming the first athlete to win back-to-back titles in the Class 100m and 200m since 1986. He ran the 200m in a Champs record 20.27 seconds. 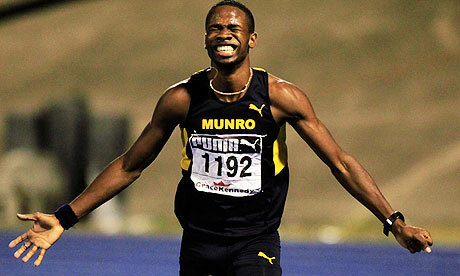 Munro also had claimed 4x400m titles at the Championships and clocked a record 3:09.21 seconds to win the event last year. They finished sixth with 98 points behind Calabar, Jamaica College, Kingston College, Wolmer’s Boys School, and St. Jago. Head coach at Munro, Neil Harrison, told MilesplitJa that despite losing 12 of top athletes from the team who graduated, things are not completely hopeless. Munro had several athletes from the TCI including Angelo Garland and Williams who followed Harrison to Jamaica when he left a teaching job in the British Overseas Territory to return home seven years ago. Harrison admitted that most of the team’s members will be competing in their first year at championships in 2014. “It’s early days yet and I don’t want to commit myself. The thing is that they are first timers and they are pretty young. One of the major challenges Harrison faces is the location of the St. Elizabeth-based boarding institution. He noted that many talented athletes are day students who live quite far from the school and so are unable to stay for training. “It’s difficult for them to stay for training so I think the school has to look at a system to see how best we can harness these talents and not allow them to escape,” Harrison concluded. The 103rd Boys & Girls Athletic Championships was hailed as the best in Jamaica’s history with over 30 records falling in the five days of action. The 2014 Champs takes place from March 25-29 at the National Stadium.